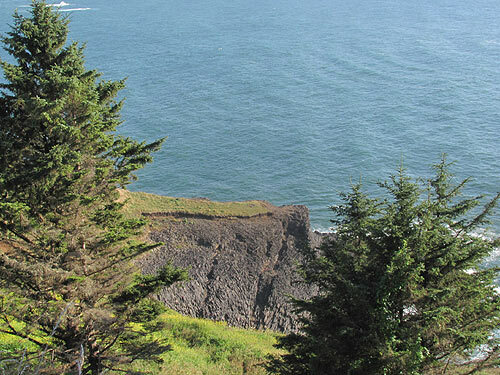 Soaring basalt monsters typify this secret chunk of coastline, close to Depoe Bay. A steep and hidden trail from Otter Crest Loop Road lets you amble down into a wild, weird forest so thick it is suddenly darker. But just as suddenly, you emerge into the bright of day with sights like these all around. This is looking down on a cliff adjacent to the forested area, which is reachable via a trail on the hillside between the two cliffs. This one, especially, has flat seat-like areas in the basalt, which let you check out the constant oceanic drama and wave action.